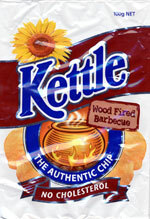 Taste test: There's more from the delicious world of Kettle Chips with their thickness and crunchiness. This time around the fabulous crisp is combined with Wood Fired Barbeque flavour. And a mighty fine flavour it is! It is not too overpowering but is still flavorsome. Unlike some other brands that overload the barbecue flavour, thus reducing the enjoyment, Kettle Chips seem to have gotten it just right. Smell test: A woody barbecue aroma — not too much cayenne pepper.